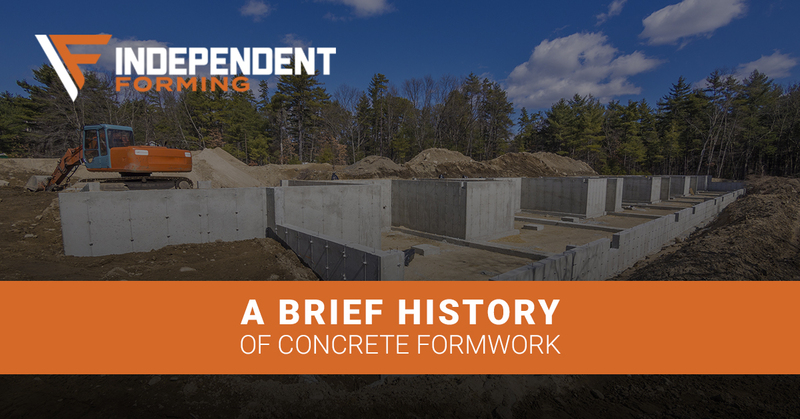 Concrete forming has a long and storied history. For over 2000 years, people have worked to get the most out of concrete or concrete-like substances to create and build structures that are safe, durable, and unique. Today, we use concrete for everything from residential driveways to highway overpasses to architectural wonder of height and style. Concrete forming and the tools and methods that have been developed to improve it are an integral part of our lives, even if we don’t notice them each and every day. Independent Forming, a leading concrete forming materials brokerage in the United States, will explore some of the most interesting and important advancements in concrete forms for walls and other structures in today’s blog. If you’re looking to buy or sell new or used concrete forms, contact our office today and see how we can get you the best prices on your required or extra materials. Concrete forming is the process of using prefabricated structures, ranging from plants to plastics across the breadth of time, to fix liquid concrete in place while it chemically cures into a solid substance. To accomplish this, forms need to be strong, flush to avoid spillage, and in most cases, removable and reusable. The ancient Romans were the first group that we know of to use concrete formwork successfully and regularly for both mundane building and architectural wonders. Primarily using reed based insulation, fiber structure, and falsework — or poured walls forms — the Romans were able to achieve building feats that were unparalleled for centuries. Both the Colosseum and the Pantheon are examples of Roman concrete forming that have withstood the test of time. The Pantheon still stands as the world largest unreinforced concrete dome structure. Reeds were preferred by the Romans for their flexibility, availability, and cost. A transition to timber forming came about after the Empire for the same reasons. However, timber also provided additional strength than reed forms and was more moisture resistant over short periods of time. Although much more durable than reeds, timber still had a tendency to warp, swell, and change shape over time, leaving room for improvement and a continued effort to find the ideal concrete form system. Timber formwork is still used in some situations today, but it has been largely replaced by more modern, more economical solutions such as modular steel concrete forms. During the early 1900s fabric formwork found its way into the mainstream construction scene for a time before becoming a more niche method of shaping concrete. Based on the early idea of reed forms that were flexible but resilient, fabric formwork allowed a mortared base to have successive layers of concrete poured and tended to be slightly more economical in terms of concrete usage and cost for certain projects. Today, it has largely given way to more reusable concrete forms for walls, footings, and pillars, but remains a popular choice when aesthetics and unique architectural choices are demanded of a smaller scale build. In 1910, the first concrete forms made of steel were manufactured in the United States and were being used for road laying and the building of concrete homes inspired by the ideas of Thomas Edison. By the 1950s, steel systems for concrete forming were abundant and could be seen in use for forming large skyscrapers in urban areas and across the nation’s budding highway system as large concrete structures such as bridges, overpasses, and tunnels were being built. To this day, modular steel concrete forms are the most popular choice among construction companies. Their durability, economic efficiency, and custom framing characteristics almost certainly ensure they will remain the preferred method of concrete forming for years to come. Aluminum concrete forms for walls and slab were developed and used throughout the 1960s. They were prized for their lightweight traits and ease of use, but over time, many construction specialists determined that their lack of strength and reusability compared to steel frames made them a less favorable choice reserved for specific projects. In 2000, plastic concrete forms were released. Yet again, the industry as a whole found their super lightweight and modular characteristics attractive, but inferior for most jobs. Insulated concrete forms — or ICFs — have been around since roughly 1940, but didn’t come into popular use until they were used extensively for the rebuilding of Europe after the Second World War. They are relatively affordable for a one-time use forming tool but lack the long-term economy of modular steel concrete forms. Although they have stood the test of time better than their more recent and less popular aluminum and plastic cousins, insulated concrete forms have still failed to overtake the widespread and deep affection that contractors and construction companies have for modular steel forms. Whether you are looking to buy, rent, lease, or sell formwork materials, Independent Forming can connect you with the products and systems that you need at a price you can appreciate. We pride ourselves on our ability to save our clients time and money so they can stay focused on the job site and the job. Give our concrete form brokerage a call today to see how we can help you acquire the right materials, or tell us about your project needs and get a free estimate today.